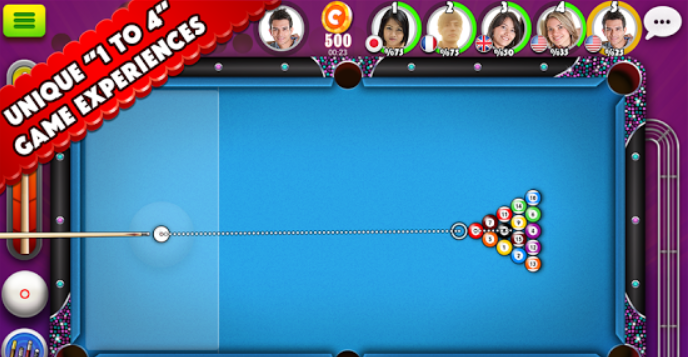 Pool Strike is an addictive 8-ball pool game app featuring colorful graphics and a robust online community. The physics are responsive and accurate, and you can even adjust the touch sensitivity of your pool stick. It comes up with realistic sound effects and the relaxing, steady pace. There are no distractions such as extraneous music or dialog boxes, and the interface is colorful but mostly uncluttered. To start playing with this game app first, you have to set an account using your social media account like Facebook or your Google id, moreover it also gives you to play using guest account. It offers you different game modes like, Play 1v1, Play 1v4, play with friends or play with randomly selected player. In addition it offers you different kind of bonuses like, free coins bonuses which every player can collect after a particular set of minutes and for its best players this app brings bonuses like, best of the day, best of the week and best of the month bonuses. It comes up with a chat function where users can type their own words and the unique feature about this game app is that you can even add your opponents to your friend list by sending a request. Play using 100 different cues and in various rooms. These cues are upgradable using the coins you earn in the game. 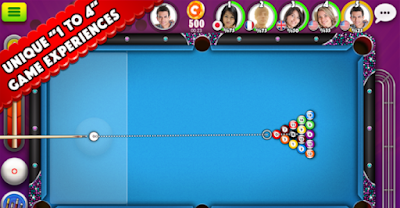 You can upgrade different features of your cue like, power upgrade, spin upgrade, aim upgrade and time upgrade. Moreover, if you are the one who won his/her first turn you are, rewarded with an extra strike bonus. So what else you want grab it today free for your iOS and Android devices and step into the ever best trending community of billiard players. Direct download link to the app is present at the end of this review.